Washington State uses a budget-based system of property taxation. In its most simple format, the taxing districts determine their budgets, and those budgets are proportionally collected based on property values within those districts. Put another way, the amount of tax obligation is determined by the taxing districts and the voters. The distribution of that obligation is determined by property values within the district. 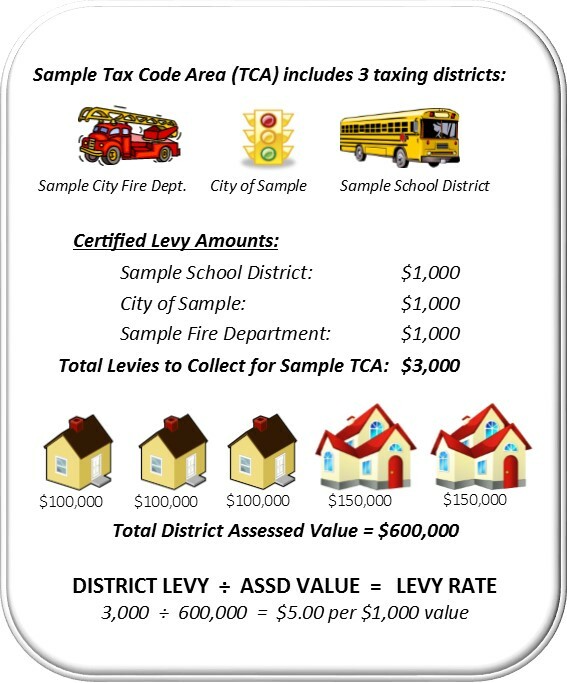 Every taxing district must certify a specific Levy amount to the Assessor’s Office by November 30th each year. The District Levy (sometimes referred to as their ‘budget’) is that amount which the district intends to collect through property taxes. A taxing district may have several revenue sources that comprise their total actual budget. District Levies are subject to a number of limitations, including a statutory maximum and a 1% cap on collection over the previous year’s highest lawful levy. The Assessor’s Office monitors and enforces these limits. The LEVY RATE is determined by the total assessed value of property within each taxing district. If a taxing district is authorized to collect $1,000 then they will collect $1,000 regardless of the property value in the district. The value only determines the rate necessary to collect the authorized amount.